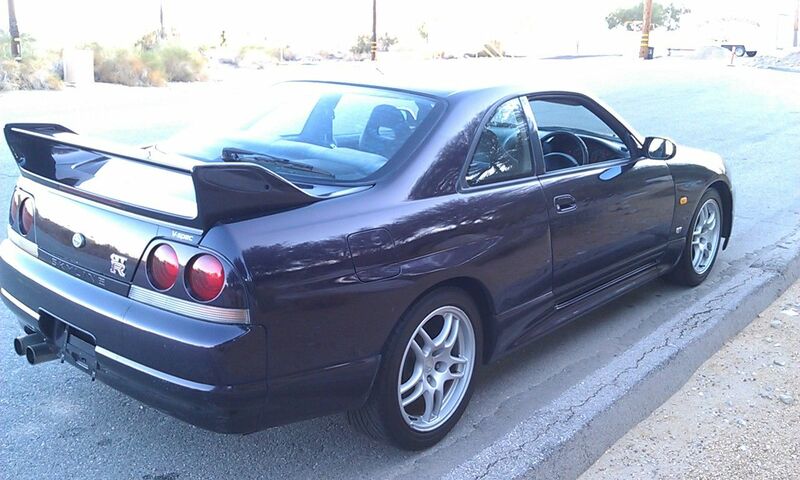 For Sale: 1995 Nissan Skyline GTR VSpec in Midnight purple. This Car has a very unique history, and has been kept completely stock since its arrival to the states in 2004. Stock 5spd manual trans 70,000 Km on the clock this car is stock, just as it arrived from Japan. Front grille is missing the GTR emblem( I have a replacement not on the car) Very rare find, Midnight purple Vspec WITH a DOT bond release. The Car was imported in December 2004 by G&K Conversions in Santa Ana, Ca. The Bond release was issued on April 24th, 2006. Most of you know that only the "96-"98 R33 GTR and GTS are only eligible for importation, but since this car came here legally before the NHTSA decided to rescinde their decision that all Skylines from 1990-1999 were legal, it was deemed legal to stay in the states. However, this car does NOT have a reissued VIN, So if you live in CA, sorry but this car is not for you unless you know full and well you will not be able to register it. Thats just the way it goes, this car was never meant to be a CA car. Serious inquires only. Text or call and make an offer (951)250-2955. Stock RB26DETT w/ 5spd manual trans. 2 door coupe free of rust and never been in any accidents.